Anon. sale, Sotheby’s, Chicago, 8 November 1999, lot 494. Private collection, New York (acquired at the above sale); sale, Christie’s, New York, 29 September 2004, lot 79. This painting is sold with a photo-certificate of authenticity from the Jacques Bailly Galerie, Paris. Certificate number 3737. Jean Dufy was born into a large family, the seventh of eleven children. He spent his childhood in Le Havre and it was here that he and his brothers and sister were fortunate to be influenced by their father’s passion for music, a theme that was to become prominent in his work. After completing school, his father, an accountant in a metallurgic company, placed Jean in an import company, holding the position of “commis de dehors”, a clerk. That gave him the opportunity to spend most of his time in the exhilarating atmosphere of the harbour, memorising all these sensations in his sketchbook, filling page by page with drawings of ships in all sizes loading and offloading merchandise from far away countries. Raoul Dufy, Georges Braque and Othon Friesz, assisted by the Parisian art dealer Georges Aubry, organised an exhibition in 1906 at the Town Hall in Le Havre to encourage the people of the city to appreciate Modern Art. It was this exhibition that included masterpieces by leading artists such as Henri Matisse, Pablo Picasso, André Derain, Albert Marquet and others who inspired the young Jean Dufy, particularly Matisse and his extraordinary use of light. He took a job as a secretary on the ocean liner “La Savoie”, crossing the ocean to New York City for nearly two years. After he completed his military service between 1910 and 1911, he settled in Paris in 1912. At this stage he painted mainly flowers in watercolour, and before long Berthe Weill showed his first watercolours in her gallery. Shortly after the outbreak of World War I Dufy was drafted, but it did not stop him from drawing and painting on a smaller scale. On his return from the war he worked with his older brother Raoul in Paris, using his talent as a colourist on fabric designs for the famous Bianchini-Férier and the same time embarked on decorating porcelain for Théodore Haviland in Limoges, an occupation that lasted for the next thirty years. 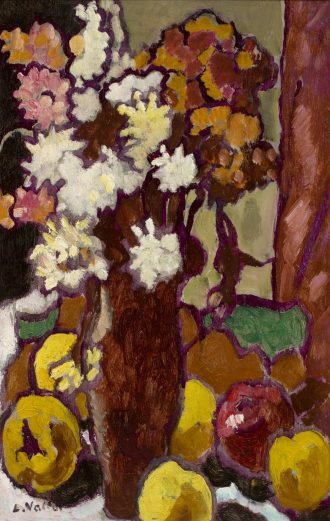 In 1920 Jean settled in Montmartre, into an artistic community, next door to Georges Braque, who he had met previously in Le Havre. Jean Dufy recalled how much the effects of light intensified the objects he painted. Fireworks of colour and light established his future as a visual artist. Jean Dufy was one of many artists who chose Paris and its monuments as a subject of his art, painting an impressive collection of extraordinary views in watercolour and oil over a period of thirty-five years. At the same time he visited many European countries, drawing his subject from famous views of major cities. Because of his work connection with Haviland in Limoges he painted many lyrical canvases of the countryside in the Limousin region, moved to Preuilly-sur-Claise in Touraine, and in 1948 he bought a house in a village near the town of Boussay, where he lived until his death in 1964.